S. J. “Sam” Whalen, a native of Frankfort, Kentucky, served in the U.S. Army Air Force during World War II. Following his discharge in 1945, he entered the University of Kentucky , receiving his Bachelor of Science in metallurgical engineering in 1949. He was employed as a research engineer by Battelle Memorial Institute, Columbus, Ohio prior to entering Ohio State University, where he received his masters degree in metallurgical engineering in 1951. After graduation he was employed by General Electric Company in Evendale, Ohio where large jet-engines were designed and manufactured for commercial and military applications. 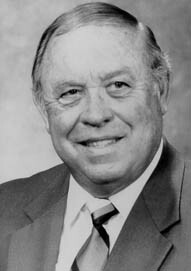 He left General Electric in 1955 and founded Aerobraze Corporation which specialized in the fabrication of jet-engine components, primarily utilizing brazing and welding techniques. He was president and CEO of Aerobraze until October of 1989. Mr. Whalen served as international president of the Metal Treating Institute, a trade association representing more than 300 companies throughout the world. He was a Fellow of the American Society for Metals, and in 1992, he received their most prestigious award, the ASM Distinguished Life Membership. This award is conferred upon industrial leaders who have devoted their time, knowledge and abilities to the advancement of the materials science and materials engineering industries. He served on numerous committees of ASM International and was the author of many articles on brazing, welding and non-destructive testing. He served on the External/Industrial Advisory Committee of the Ohio State University Department of Materials Science and Engineering, was recognized by OSU as a Distinguished Alumnus, and was presented with its Outstanding Service Award. He was a member of the OSU President’s Club and the Board of Trustees of Lees-McRae College in Banner Elk, North Carolina . Mr. Whalen was a Fellow of the University of Kentucky and in 1993, he was presented the C.S. Crouse Award by the UK Department of Materials Science and Engineering for Outstanding Achievement. Mr. Whalen died November 10, 2009. His wife, Mildred, passed away in 2014.